I am collecting 123 now because they are difficult to find and fantastic pieces. A friend asked if they for my grandkids to be, and I answered, no way. Guess it is time to start collecting used, chewed on 123 pieces so there will be some around in a couple of years when I do have a grandchild. Found over 30 of the 123 figures new on eBay, and they are wonderful! They offer three sizes of figures: adults, children and babies. And I have about a dozen with dark skin. Wish they offered some Asian 123 figures. The international market for toys for toddlers is huge, especially in Asia, so PM needs to jump on the bandwagon and offer some Asian 123 sets. I'm starting to really fall in love with the 123 series, myself! The are just soooo CUTE!!! Hm, I'll have to think about what else I'd like to see. I need to look through past sets, I'm not entirely familiar with what's already been done. Have they ever had a 123 dollhouse? That could be really cute, a kid's first little dollhouse, with furniture sets and all. Yes, they've had a few different house and furniture sets. I initially bought some 123 figures for the klicky lucky dip at Kirkbean Exhibition so younger children could choose one, However I think they're really cute and have started collecting them for myself. I recently got some figures with vehicles which I really love and also have the safari and circus jigsaws, a train and station (but no track yet) and various figures and animals. The figures are just right for little hands to hold. I can't wait for the new 123's to reach the US! 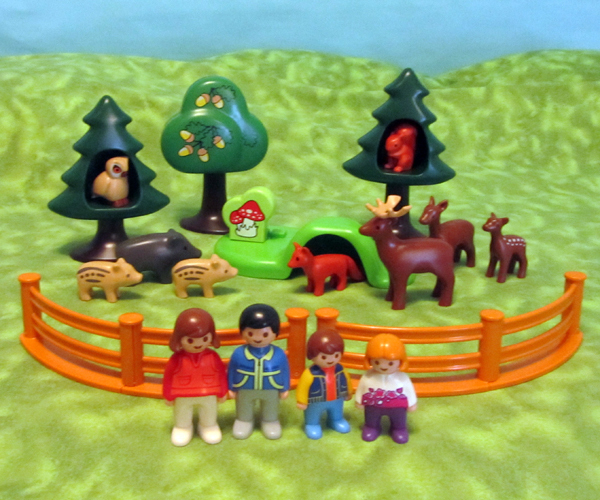 The truck and garage, bus, and spaceman are adorable, and Tim's wildlife park is also a must have. Skywalker, you have some neat stuff I never saw. I really like the look of the bus and the rocket. Why didn't they make that rocket for the normal line?